Something sinister is happening in the village of Scarborough, and you've been hired to find out what. But what you'll find is even worse than you can imagine. 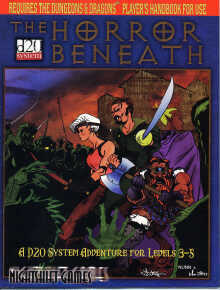 The Module : This is the first D20 adventure from Nightshift Games. The artwork has been pulled from several artists and the variation in each of their styles impacts on the professional look of the module. The quality of art ranges from fair to good. I was most disappointed with the maps which are very dark, (perhaps I have a badly printed copy? ), and two of the town/village maps are not even labelled. The quality of the maps is also poor being computer generated, I suspect, in colour and being transferred to Black and White paper. Even the resolution of the images seems poor. As for the scenario itself, it introduces a new monster type although you will have seen many similar types as it is based on the worker/queen ant model. I find the scenario small, consisting of only 12 "rooms", and these are generally fairly standard. On the plus side module was well written and would be quick to get moving. All in all not good value for money and under the d20 licence there is a great deal of competition for those customer bucks. I additionally disliked paying for a two page introduction to their NEXT adventure and the end of this one. Good Points : Pretty much ready to run. Bad Points : Artwork patchy, Maps pretty terrible, adventure basic.